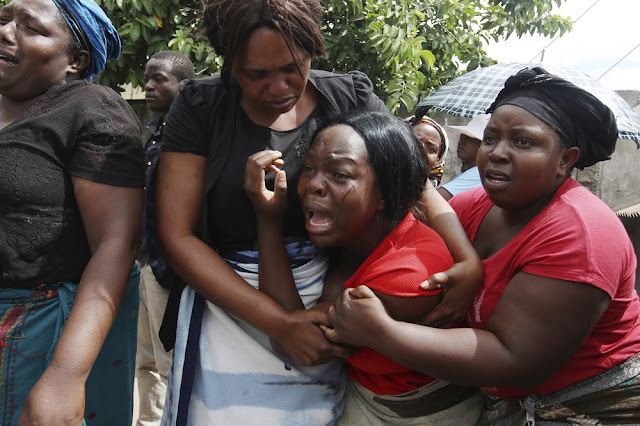 HARARE, Zimbabwe (AP) Before the family of Kelvin Tinashe Choto knew he had been killed, social media in Zimbabwe was circulating a photo of his battered body lying on the reception counter of a local police station. Angry protesters had left him there. The 22-year-old was shot in the head, one of at least a dozen people killed since Monday in a violent crackdown by security forces on protests against a dramatic increase in fuel prices. Dozens of Zimbabweans have been shot . Others say they have been hunted down in their homes at night, with soldiers and masked people in plainclothes dragging them away, severely beating them and leaving them for dead. Some are activists and labour leaders. Others, like Choto, have been in the wrong place at the wrong time. A captain at a small soccer club in Chitungwiza, a town southeast of the capital, Harare, he had been planning to travel to neighboring South Africa next week to look for better-paying teams. His son had been watching the protests from a soccer field, “some meters away from the action,” on Tuesday when he was gunned down. “Maybe they thought he was an (opposition) activist since he was wearing a red Manchester United jersey,” his father told The Associated Press. The family only discovered his body the following morning at a local mortuary. Such accounts have quickly undermined the faith of many Zimbabweans in the government of President Emmerson Mnangagwa, who was briefly cheered when he took over after the ouster of longtime, repressive leader Robert Mugabe in late 2017. Since then, the country’s already staggering economy has weakened even more. Growing frustration over rising inflation, a severe currency crisis and fuel lines that stretch for miles finally snapped after Mnangagwa announced a week ago that fuel prices would more than double, making gasoline in Zimbabwe the most expensive in the world. Civic leaders called for Zimbabweans to stay at home for three days in protest. Other people took to the streets. Some looted, in desperation or anger. The military was called in, and with Mnangagwa leaving on an extended overseas trip, the hard-line former military commander and Vice President Constantino Chiwenga was left in charge. A crackdown began. In what critics have called an attempt to cover up abuses, the government in the past few days has imposed internet shutdowns across the country, ordering telecoms to block popular social media apps or everything at once. “The internet was a tool that was used to coordinate the violence,” presidential spokesman George Charamba asserted on state television Saturday night, referring to protesters. The internet shutdowns have given security forces cover to commit violations “away from the glare of the international community,” said Dewa Mavhinga, southern Africa director for Human Rights Watch. At one hospital in Harare alone, the waiting room and corridors were packed with victims. “They came at the middle of the night, kicking doors and throwing tear gas to force us out. Once they had rounded all up men in the area, they assaulted us using motorbike chains,” one man said. Another man with burnt hands said he and others had been forced to put out burning tires with their bare hands. They all spoke condition of anonymity for fear of retaliation. Albert Taurai, who had a broken spine, said he had ventured out to look for bread when he saw a group of plainclothes, armed men approaching. Zimbabwe’s government has defended the response by security forces, and police spokeswoman Charity Charamba on Saturday expressed “grave concern” that people were committing crimes while wearing police or military uniforms. Some of the uniforms had been seized by “rogue elements” during the protests, she said. Otherwise, “adequate security” was in place to ensure that people in Zimbabwe go about their lives, army spokesman Overson Mugwisi said. They did not take questions. The main opposition MDC party, which had contested Mnangagwa’s narrow election win last year in court, “is hoping to influence the international community’s view of Zimbabwe. They are hoping a government of national unity will arise from this. It will not happen,” the deputy information minister, Energy Mutodi, told the AP. 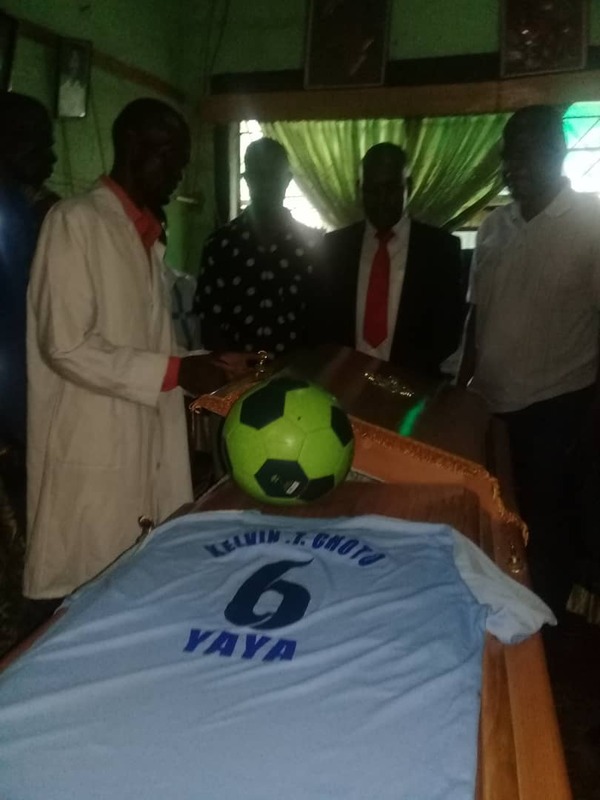 The leader of that opposition, Nelson Chamisa, attended the funeral of Choto the soccer player on Saturday, to loud cheers. The government should compensate the victims of this week’s crackdown, Chamisa said. He said Mnangagwa’s government has turned out to be much like Mugabe’s. “This is a sick government, because no serious government will deploy the military and ammunition on ordinary citizens,” he said, Choto’s seven-month-old daughter in his arms.